Welcome class of 2017, and welcome back to everyone else. This academic year brings exciting improvements, services and events at your University Library. Several small renovation projects, for instance, are underway that we hope will both enhance your library experience and enable us to provide more creative spaces for living and learning at Falvey. The addition of the Learning Commons in Falvey has been a wild success in terms of the numbers of students aided by the Learning Support Services office, the Mathematics Learning Resource Center, and the Villanova Writing Center. Please keep in mind the 2nd floor of Falvey is also where you find the Research Support Center, including librarians ready to help you with your library research and projects. Last academic year we also held a record number of events and programs in Falvey, something we take seriously as a library at the cross-roads of campus. Intellectual and cultural programming benefits learning, provides consciousness-raising variety to student life, and counts as co-curricular activities for current Villanova students. Falvey provides access to over 700,000 volumes of published human knowledge, but we also see the Library as a laboratory where the University community can now access just as much virtually as it can physically. In fact, the library website and its discovery software, VuFind, provide 24 hour access to an equal number of digital volumes of material, and another 20,000 items in our Digital Library. In addition to being a gateway for services, such as E-ZBorrow and Interlibrary Loan, Falvey’s website provides a “My Account” link. Your account is where you can see a list of the items you have borrowed, holds, requests, fines, and saved searches. “My Account” even lets you renew items. Subject, topic and course guides are also on the library website. The website conveniently provides access to the many databases and other web-accessible resources essential to scholarly searches for information. Near Falvey’s main entrance is the access and information desk where you can get quick help or be referred to a subject specialist librarian. Students invariably find making an appointment with their personal librarian a valuable experience for conducting library research more efficiently. If you need assistance, there are email, chat and texting options for connecting with library staff. You are the community we serve. We are here to guide and assist you. Please don’t hesitate to contact the Library for all of your research support needs. We are conveniently located on the web, as well as at the heart of Villanova University’s campus. You can always learn about what is happening at the Library by checking our Latest News and Upcoming Events sections. As the interim director of Falvey Memorial Library, I plan to write a monthly blog feature. Stay tuned for more from Falvey, an award-winning academic library of excellence. We are planning to enhance our offering of services, as well as spaces for study, interaction and engagement. It is going to be an exciting year! 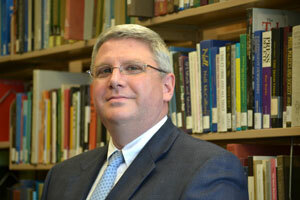 Darren Poley is the interim library director and can be reached by email or by phone at 610-519-4290.